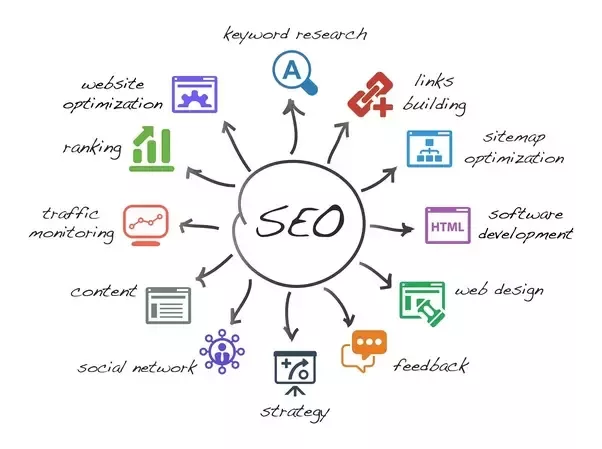 SEO is a process to optimize the Website to improve the Websites SERP (Search Engine Results Page) Rankings. SEO is a process to optimize the Website to improve the Websites SERP (Search Engine Results Page) Rankings. It's often referred to as "Organic", "Natural", or "Free" results. SEO’s full form is Search Engine Optimization. In simple words, SEO means optimizing the Website to improve it’s visibility over Search Engines results. SEO includes On-Page & Off-Page activities to increase SE’s rankings. On-Page SEO means optimization over your own Website. Off-Page SEO means optimization over external websites which links to your Website. How do I improve SERP Rankings doing On-Page SEO? How should I start SEO from basics? Content: "Content is King", you may have heard of it and it's really true. Content should contain information related to the Keywords you target. Content should be easier to read through. Paragraph formatting is important. Content should be unique. Can use Bold or Italic texts to highlight the texts as important or an information or a definition. Build contents that is powerful enough to earn natural links naturally. Heading Tags: Provide suitable heading tags, initiate with H1 heading, sub-headings can be written under the hierarchy of H2 to H6 tags, for each of the paragraphs on your Webpage. Images: Provide images wherever applicable, images speaks more than text, write alt text for all the images. Internal Linking: Interlink other pages from your Webpage content with the right Anchor Tag. Page Speed: Check for Page Speed issues using Google Page Speed Tool or GTMetrix or Pindom Tools & fix the page speed issues. Sitemaps: Create sitemap for users to find all your Websites in HTML form and another sitemap in XML form for search engines with all your Webpages URL, which can be further used to submit it to search engines. Does Offpage SEO (Link Building) still work? Link Building: Link Building is an Off-Page SEO approach to build inbound links (or backlinks) from external websites to your Website. It’s always important to build high-quality links, which is considered to tough these days. Links from highly authoritative Websites like HuffingtonPost, Wall Street Journal & Daily Mail not only helps in SERP (Search Engines Results Pages) Ranking, but also getting traffic to your Website. How to build high-quality links? Write Compelling Contents that gets links naturally, likes, shares & comments through Social Signals. Share the content through Press Release distribution, Guest Posting, Articles Directories, Social Sites. Ask Website Owners with Broken Links to fix it & link back to your site for relevant pages. Participate in Forums, Q&A’s sites, News sites commenting with relevant information from your Website & link back to your site. What SEO strategies has worked? Website Analysis to find out issues with an existing website. Keyword Research to find the right keyword which should drive traffic & conversions. Niche Competition is really important to understand before optimizing our Own Website. Setup Google & Bing Webmaster Tools to find issues with your Website, as these tools report issues with SEO on your site. And monitor it regularly. These tools helps in optimizing Title, Meta Description, Onsite issues, crawling & indexing issues. Setup Google Analytics to track Sessions, Users, Pages/Session, Avg. Time Spent/Session, Bounce Rate, this further helps in optimizing the site considering Content Readability, Internal Linking & Anchor Text Optimization. URL, Title Tag & Meta Description are key metrics to drive better CTR to any Website, as it’s the first impact over the users through SERP. Keywords Rich Texts should be used in URL, Title Tag & Meta Description what users wants to read further. Heading Tags H1 can be present once with a right heading which explains entirely the content on the Webpage in just 8 to 12 Words. Usage of H2 to H6 heading tags can be done to write Sub-Headings & Sub-Sub-Headings through the Page Content. Content Optimization should be done in a way, that content is unique & plagiarism free. It should have a good readability score. Contents should be easier to read & understand. Usage of Images & Videos makes easier to users to understand the theme of your Website Pages. Image Alt Tags should be provided to all the images on your Webpage, it’s better for search engines to understand about the theme of your Image, which may appear in Search Results as well. Internal Linking helps users to navigate to other Webpages to read more about the text linked. It also helps in reducing bounce rate of any Website. Anchor Text Optimization is to optimize the links present on the Webpage, select the right text which users keen to read more on. Write Regularly on your Blog, relevant Topics as of your Website, link to the website pages if required. Share it on Social Channels. Sitemap & Robots.txt file for Search Engines to find & crawl your Website pages. To block any webpage of any directory from your site you can make use of robots.txt file. While into sitemap list all the URL’s to submit to search engines. Submit Sitemap to Search Engines to index updated pages. Guest Posts are the way to get quality links to your Website. Write quality guest posts using right Keywords which gets traffic. You can use links in your profile or into your posts describing about your Company or Profile. Social Channels are now widely used worldwide, thus as of your Business select the right channel among Facebook, Twitter, LinkedIn, Pinterest, Instagram, Google+, YouTube or any other. Post Regularly on the selected channel. Participate in niche channels i.e., like, comment, follow, share or subscribe. Target Local Market through creating your Business Page on Google+, Bing Places, Facebook Maps & other Local Business Directories. Get Quality Links from sites with high authority score. Focus Your Users, think of your users what they need from you & write according on your Website, Blog, Guest Posts, Articles, Social Sites or Forums. How to know if you are doing SEO correctly? Setup of Google Search Console or Webmaster Tools & Google Analytics is important to analyze your SEO process. Analyze the initial status of your Website such as Traffic, Time Spent/User, Session Duration, PageViews, Bounce Rate through Google Analytics. Webmaster Tools helps with understanding CTR (Click-through-rates), Clicks, Impresssions, Keywords, Average Keywords Positions in SERP (Search Engine Results Page). Regularly monitor the performance of your Website through Google Search Console or any of the Search Engines Webmaster Tools and Google Analytics. If you find an improvement, not to worry, you are already in the right path, continue with it. P.S. : It’s my 100th answer on Quora and I am enjoying writing answers on Quora. If anybody finds it useful, do upvote, share on your social channels, write comment below the answers. I appreciate your feedback. Thanks to Pramod K. Ram | Digital Marketing Consultant, RK Web Solutions, Mumbai. Zajtra.sk > Marketing > SEO/SEM > What is SEO and how does it work?